The future of mold removal. A new spin on remodeling/Remodel Coach. 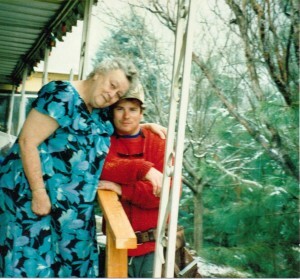 My first ‘aging in place’ project was building a set of stairs and handrails off my grandmother’s porch. I was recently looking back at those photos and I had to note the many changes since they were taken nearly twenty five years ago. Although I could point out the changes in my hairline (my children were happy to do that for me), I was referring to all the changes in ‘aging in place’, and how all of these new and exciting innovations would have made my grandmother’s daily life more enjoyable and satisfying. But the biggest thing is that simple adjustments would have allowed her to continue living the way she wanted to. Independently. What is aging in place? Wikipedia defines it as the ability to live in one’s own home – wherever that might be – for as long and as confidently and comfortably possible. Livability can be extended through the incorporation of universal design principles, and other assistive technologies. Assistive technologies include communications, health and wellness monitoring, home safety and security. I personally think aging in place means so much more. Freedom, independence, comfort, dignity, and opportunity are words that come to mind; the opportunity to make decisions and choices that will affect the quality of your life, or that of a loved one. Fall prevention is one of the easiest and least expensive things that can be added to help a senior in their home. Falls are the leading cause of death from injury among older adults, one third of those falls are directly related to easily avoided hazards in the home. Falls are also recurrent and 66% of fall victims will fall again within 6 months. There is a senior related death due to a fall every 35 minutes. The sad thing, is a lot of these falls are so easily prevented, by being proactive and installing grab bars and other aids to prevent a fall before it happens. This could be one of the best gifts you could give to yourself, or a loved one. The gift of continued independence. Now that nearly 77 million baby boomers are reaching retirement age, the options for aging in place in your home are bigger than ever. The Fix it Guys are proud to be a partner in a revolutionary new global approach to energy conservation. As we move forward into the future, we are increasingly aware that we must take action now and reduce our energy consumption. Energy efficiency is a key factor in becoming more sustainable and this is why we have focused on ways to reduce energy consumption and ultimately save on energy costs. Two of the largest energy consuming products are refrigeration and air conditioning. Real dollar savings can be achieved by the efficient running of well-maintained equipment. Our unique coating, once applied, is able to prolong the life of your equipment, increase efficiency and ultimately reflect in savings on your energy costs. We believe in working together to create a sustainable environment for the future. EcoActiv CRC is a unique coating applied to the condenser units, coils, fins and fans of commercial HVAC units, air conditioning systems and refrigeration that will fundamentally reduce energy consumption due to the follow properties of the coating. The coating once applied will ensure that moisture/water does not build up and frost. Normally the refrigeration system would frost due to moisture and then the system would have to run a defrost cycle (heating) in order to eliminate the frost build up. EcoActiv CRC being hydrophilic, means that the water isn’t able to adhere to the surface. The coating is also antistatic which eliminates contaminants such as mold and other bacteria from adhering to surfaces, leaving the equipment to run more efficiently and eliminating mold and bacteria being circulated throughout the space, making for a cleaner work environment. This program is designed to enhance existing maintenance programs, by demonstrating simple techniques to ensure that you are employing best practices and to ultimately save energy. Energy savings, of course, translates to dollar savings and a cleaner working environment. The technicians will clean your system including the fans and fins, flush the pipes to rid them of any blockages and apply a hydrophilic coating to protect the equipment for 12- 24 months. Our qualified technicians are not a replacement for your regular Refrigeration and Air Conditioning Mechanic. We recommend that you maintain your regular servicing by these professionals in conjunction with our program. The most amount of energy is consumed when the refrigeration switches to the defrost cycle and it is using energy to heat and melt the ice and then to cool again to maintain temperature. Naturally, if your equipment is cooling and then having to heat (defrost), it will be consuming more energy. The cycle can occur more often if the system is not clean, using more energy. The coating keeps the equipment clean and reduces or eliminates the equipment going into the defrost cycle. As the coating will reduce the need for the refrigeration to work harder by not having to complete the defrost cycle, this in turn places less stress onto the system. Labored machinery means a higher cost to run. The coating will also assist in maintaining your equipment with its antistatic properties by repelling dust and bacteria from adhering to the surfaces it will run more smoothly and have a longer lifespan with real dollar savings achieved by reduced maintenance and replacement costs in the long term. In addition, an increase of wind speed will ensure that the cool air is distributed evenly throughout the space. Often biofilm, made up of mostly body fats and fats from food, can build up in the drip tray of the system, as they are caught within the moisture in the air, circulated by the fans and eventually collect in the pan. These fats block the drip line which can then overflow into the path of the fan, causing the water to then be sprayed throughout the area; additionally this water can contain contaminates. The mold and bacteria can readily circulate throughout a building as it is blown straight back through the fan system. The coating, being a non-adhesive solution will eliminate build up, leaving your work environment cleaner and healthier. Our unique coating has assisted companies to achieve energy savings from 10% up to 48% therefore enabling them to reach targets for reducing their carbon footprint. Long term use of the coating will ensure maximum savings and greatly contribute to you and your companies sustainability goals. This makes using Ecoactiv CRC Coating not only a fiscally sound decision, but also an environmentally responsible one, too. The Fix it Guys are proud to be Goldmorr® System Master Technicians. The Goldmorr® System of mold removal is the future of Mold Remediation. This unique system has had years of success. It’s guaranteed to remove all types of mold from your home or building safely, quickly and with less cost than traditional methods. In most cases, home and business owners do not have to relocate while the remediation process takes place, nor do they have to have drywall and furnishings removed and incur additional reconstruction or refurnishing costs. Put simply, most of the time The Fix it Guys will be in and out in a day. But hurry! Mold left untreated will continue to grow and cause more damage. The first thing our mold remediation specialists do is perform a complete inspection of the whole structure to evaluate the level of contamination. The Fix it Guys uses sensitive infrared photography and moisture metering to find hidden moisture which can be causing mold or growth. The findings are then carefully recorded; that way our mold crew ensures that the remediation process is fully complete at the end of the project. The patented Goldmorr® fogging system used by The Fix it Guys, will penetrate tiny openings and pores, with nontoxic solutions which can destroy mold spores. Nontoxic fogging can remove mold hidden behind walls. In some cases, fogging reduces the need for expensive, disruptive drywall demolition. Mold remediation usually includes physically cleaning the mold-affected areas with bio-cleaning solutions, removing the materials affected by mold (if needed), and vacuuming the contaminated area, as well as the rest of the structure, with HEPA Negative Air Filtration devices. WE OFFER HOURLY PROFESSIONAL HANDYMAN AND ORGANIZATIONAL SERVICES FOR ALL YOUR HOME AND OFFICE PROJECTS. We can provide professional instruction to help you complete that project yourself. Do you have a honey-to-do list, home or office projects which you have been delaying since you do not have the time, energy, help, or know-how to do them yourself? Do you have a hard time giving away your hard earned money to others? Well, if that is the case, keep reading! we have a win-win solution for you. You can do some or most of the work yourself, and ask us to complete the parts of a project you cannot, or do not have the required tools for!! You will be completely in control of your project. (In approximately 4 hours, Mark taught us how to install and trim pre-hung interior doors, remove and install new window sills, and baseboards. It took us a few weekends, but our families were so impressed that we did the work ourselves. Many thanks “Fix it Guys”. RB , Colorado Springs). Plan creation, Budget development, Project and time management. Cost effective methods of construction. Generating a material list and help with sourcing. You can advance the project on your timetable, not at the mercy of others schedules. Your learning curve will be greatly reduced, preventing costly mistakes and reducing the stress and frustration that is common when performing home improvement projects. Contact The Fix it Guys and let us coach your next home project, to a complete success. The Fix it Guys are proud to announce their commitment to use American made products and Supply’s on their projects. We realized the benefits of buying American made products go far beyond our original goal of supporting local businesses and manufacturers, and sustaining jobs here in the USA. But that we would also be helping the environment, by limiting the carbon emissions that shipping from other countries thousands of miles away produces. We will be adding new American made / Made in the USA products as they come available. In Bozeman, Mont., Anders Lewendal is hard at work building a home he hopes will be a blueprint for creating jobs in America. Lewendal, an economist turned builder, is constructing a house made entirely from U.S.-made products. Everything from the nails, screws and bolts, to the steel, staples and bathtub is made in the United States.”Every piece here is made in America,” he said. Anders Lewendal, an economist turned builder, is constructing a house made entirely from U.S.-made products. // ]]>Here is the list of products Lewendal is using to build the made-in-America house. “[We're] one of the last makers of nails in this country,” company president Roelif Loveland said. All Images and Content © The Fixit Guys 2011. All Right Reserved. Website Design by Rocky Mountain Webs.